A friend of mine, and one of my blog followers, and occasional commenters, Alec Stansell, of Massachusetts, posted this picture on his facebook page. I liked it and decided to share it with my readers. It is some carded streamers and a bottle of head cement from the Percy Tackle Company, of Portland, Maine. Percy Tackle Co. was started by Gardner Percy, I believe, back in the 1920’s. The flies are a Mickey Finn (left), unknown (center) – I have put in a message to Alec to identify it, and a Gray Ghost. The head cement is pretty cool too. Wonder how it would work? Old collectible items from the Percy Tackle Company, of Portland, Maine. The flies are attached to the card with a staple over the hook bend. 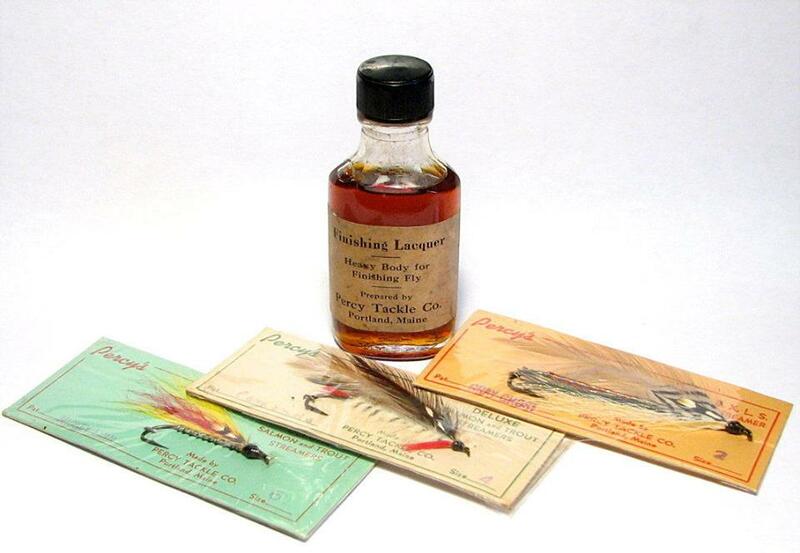 This was the most common method of attaching streamers and bucktails to cards. Don’t forget, you can click on the picture, and it will enlarge for a bigger image. If you have a new touch-screen laptop like I do (still getting used to it), then you can also make the pic bigger just by moving your fingers…either way works. This entry was posted in Fish Stories and Other Tales, Streamers and Bucktails and tagged Gray Ghost, Mickey Finn, Percy Tackle Company, Portland Maine. How were the flies attached to the card Don? I meant to include that…they are stapled over the hook bend. This was the most common method of anchoring streamer flies to cards. Carrie Stevens used her own method, she wired the fly to the card though the hook eye and at the bend. Every fly, perfectly positioned on the card. She knew the elements of marketing and presentation for sure…thanks for your question! A great bit of history – didn’t the Percy Tackle Co. go out of business in c.1920? Without looking it up, I do not believe so Darrell. Bates streamer book tells of one of Percy’s tiers, Nellie Newton, tying Black Ghosts for a customer in 1927 at a show in Boston. And just now, I am seeing facebook page ads for Percy Tackle Company…but the flies are imported, they were selling Parachute Adams for $.54 cents each. Perhaps my buddy Alec can shed some light on this…thanks for your comment! hmmm… I must be thinking of a similar sounding tackle shop from that neck of the woods – i’ve been trawling though too many books and blogs recently – or maybe it’s just a failing memory!!! LOL! Hi Don – The Percy Fly Co. Still exists! Currently the name is owned by LL Cote of Errol NH and flies are still sold under the Percy name. Percy’s started in 1888 making it America’s oldest extant fly company. When I had my fly shop in Portland you could still buy Percy Flies on the old cards from Johnson’s Sporting Goods on Congress St.. The company at that time was owned by my friend and customer Peter Sang, a wonderful fly tyer whose “Sang Sand Eel” was a local favorite striper pattern, and a killer one at that. His “Sang’s Frog” is also worth remembering and tying today – an unusual and effective frog pattern. I believe both of those patterns appeared in early issues of FT. A lot of history associated with the revered old name PERCY! Very cool Alec! Your additional information is welcomed indeed, and adds credibility to this bit of an article featuring Percy Tackle Company flies and old head cement. Thanks for your input! Appreciate it! I do not, Lance. never heard of them. Pic of flies would be great! Thanks for your comment and offer to send pics!